A temporary wooden trestle adjacent to Fulton Street in Woodbridge had come into use that very afternoon so that labourers building the New Jersey Turnpike could work on the main line. Eight days previously train engineers had been told to slow to 25 mph through Woodbridge rather than the normal 60 mph from 1.01 pm on Feb 6. However it appears that despite being reminded of the restriction by his conductor prior to leaving Jersey City the engineer Joseph Fitzsimmons failed to slow the train and the subsequent enquiry found that it had been travelling at over 50 mph when it hit the curve approaching the trestle. About a mile before the Woodbridge the conductor, alarmed at the train's speed had tried to pull the emergency cord but the crush of passengers made it impossible. 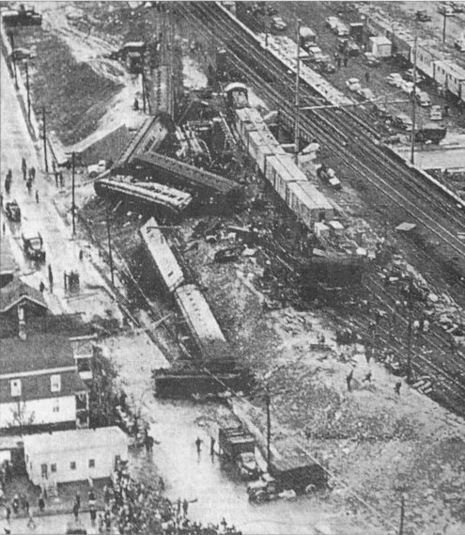 The weight of the locomotive shifted the tracks, causing the derailment; and eight of the eleven cars derailed; the first two cars just fell on their side but the third and fourth cars jack-knifed into each other as they hurtled down a 26 foot high embankment is was in these two cars that most of the 85 fatalities occurred. The fifth and sixth cars were left hanging in mid-air over a street which was shiny from rain, and many who survived the crash jumped to their deaths believing they would land in water. The accident happened at 5.43 pm in a densely populated area and help soon arrived in response to the town's emergency whistle; neighbours opening their houses to those in need. The seriously injured were taken to hospital in nearby Perth Amboy and a makeshift morgue set up in the Woodbridge firehouse. No headstone marks the spot. There is no memorial only a deep crack where a concrete bridge was repaired identifies the place where death visited Central Jersey a half century ago. 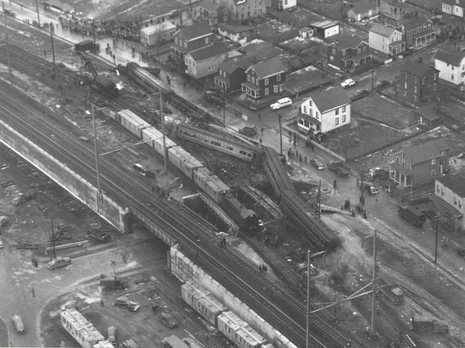 On the cold, drizzly night of Feb. 6, 1951, a Pennsylvania Railroad express train called "The Broker" derailed and crashed on a temporary trestle near downtown Woodbridge. Eighty-five of the 1,100 people on board died and hundreds were injured. Five decades later, the legacy of the crash - the deadliest American railroad accident since World War II - remains as sharp, tangled and twisted as the mass of steel strewn that night on the 26-foot-high embankment along Fulton Street.